IPTV (Internet Protocol Television) enables streaming of video content over an IP network. This has multiple applications, such as live feeds, TV channel streaming, video on demand and real-time information feeds. IPTV increases the quality of streams over traditional coaxial RF systems, as well as allowing for flexibility in installation and channel selection. Instead of fixed channel selection, viewers have unlimited possibilities in terms of what they choose to view. IPTV is television that is distributed and streamed over an IP network. Due to its flexibility and scalability it can be used in various industries and is compatible with multiple display devices, from consumer televisions and professional displays to mobile phones and laptops. 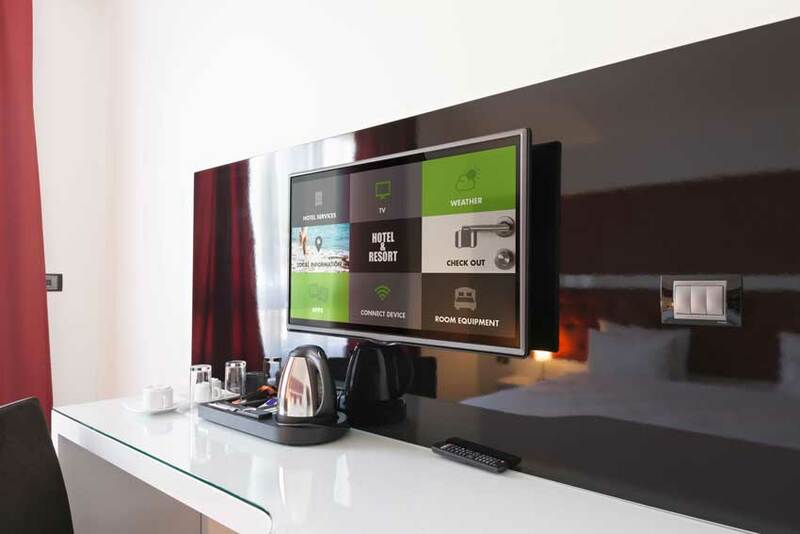 Traditional hospitality TV solutions limit you to a few channels, preselected by the hotel. IPTV provides viewers with a wide range of streamed channels, as well as movies and series on demand. Additional benefits include the ability to pause, fast forward, rewind and even record. The systems are fully compatible with service providers, such as DSTV. Hotel management systems can be integrated to provide guests with hotel services, such as room service, viewing menus and making reservations for the hotel spa or shuttle. IPTV can be used in transportation hubs, such as airports and train stations, to provide commuters with real-time information and live feeds on the display/information boards. This allows information about delays, travel time, boarding information and routes to be timeously communicated to travellers. All corporate offices have displays of some kind, whether they be desktop screens or displays advertising company content. IPTV can be used to display real-time informing, ensuring that employees are informed about market fluctuations and the latest business news, on these devices. The company can also communicate with employees and provide training, across the network, using IPTV. Real-time content: consumers are able to stay up to date with news on their mobile devices, at any time, wherever they are. Effective communicate: company can communicate news/announcements and provide training across the network.